In the last post Introduction to OWN we discussed what is OWIN and looked at the OWIN specification. 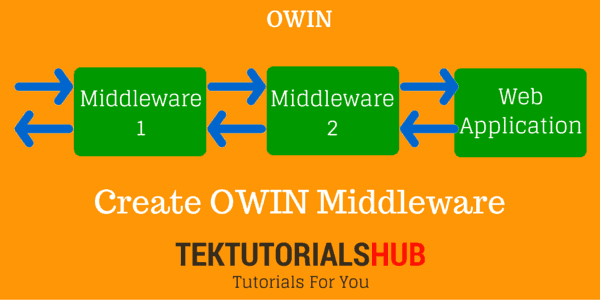 In this tutorial, we will build a small application and show you how to create OWIN Middleware. OWIN is just a specification. KATANA the Implementation of OWIN specification. The following namespaces are from KATANA Project. The Microsoft.Owin namespace has classes that support OWIN collections. This is basically a helper namespace. It has types and abstractions which help in creating OWIN Components. You can Install it from Nuget using the following command. The above error says that the OWIN in unable to find the startup class. Startup class is similar to global.asax in classic ASP.NET. OWIN Applications look for this class during the application startup. Startup class is where middleware’s are registered to be used in the application pipeline. There are few different ways you can specify the location of startup class. OwinStartup Attribute is added to the startup class. Here replace the NameSpaceHere.StartupClassNameHere with the actual root namespace and startup class. The OWIN looks for startup class in the Configuration file. If not found, then looks for a class with OwinStartup Attribute. Finally, in the Root namespace with the name startup. Every middleware that we write must have the following signature. A Func which accepts the Environmental dictionary and returns a task. In the above code our constructor accepts the Func<IDictionary<string,object>,Task>. We need to create a local variable to store this reference. This is done by the variable __next in the above code. Invoke method accepts the Environmental dictionary (IDictionary<string,object>). Use this method to perform some task. Once finished call the next Middleware using _next.Invoke(enviroment) and wait for it. Configuration method of Startup class is automatically invoked by the OWIN Server. Inside the Configuration method middleware’s are registered using the use method of the IAppBuilder interface. The above screenshot is the output from the application. Put a break point inside the Invoke method and check the values of the environment variables. There is another simpler way to create the Middleware. That is by Inheriting from the abstract Base class OwinMiddleware. This class is defined in the namespace Microsoft.Owin. Registering the Middleware is similar to the what we did for the FirstMidleware except we now pass the middleware using typeOf operator. 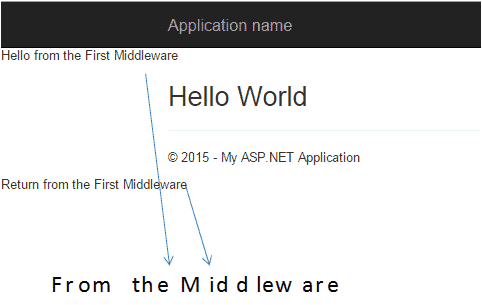 You can register the middleware by creating the instance of the middleware. In such cases, the middleware must implement the Initialize method which accepts the Func<IDictionary<string,object>,Task>. We have learnt to how to create and use OWIN Middleware in our Application. The new ASP.NET Identity system makes extensive use of OWIN Middleware. You can refer to these tutorials from the following links.